The Silver Threads are a classic country band with a world class singer and hot Nashville pickers! Classic telecaster country picking, pedal steel, upright bass, fiddle and drums from seasoned pros who will deliver a high quality and fun show! They play everything from corporate events to weddings & church services, PLUS 5 weekly shows in the legendary honky tonks of Lower Broad, Nashville. A band for country two steppin' or swing dancin', we play 100's of honky tonk hits from the 50's through the 70's from country's great stars: Patsy Cline, Loretta Lynn, Johnnie Cash, Merle Haggard, Tammy Wynette, Connie Smith, Hank Williams, Wayland Jennings, Carl Perkins, Elvis, Johnny Horton & more! Saw them this afternoon at the Nashville Palace and enjoyed every minute of them on stage. A must see. Thank you for talent and dedication to real country music. Rumors of country music's demise ain't true no more. One of my earliest memories is age 4 or 5 waiting to eat biscuits made from scratch and Crisco in the kitchen and trying to sing Silver Threads and Golden Needles with the cook. Half a century or so later I thought real country music and genuine soul-blistering honky-tonk had kicked the bucket or was at least brain dead. But turns out it has been playing out live as The Silver Threads for a while now. After years of thinking I wanted to strangle the next fool I heard pretending to be a "country music" whatever, I gotta say that's a delightful problem to have. God bless 'em. They are the real deal. Heard them for first time tonight and enjoyed it immensely. Foot stomping and hand clapping required. My first encounter with the Silver Threads was while walking down Broadway and heard their unmistakable sound. . Whether it is at the Nashville Palace or Roberts Western wear. A great group of people I'm proud to have met.. True musicians !! Look forward to each time I hear them perform. 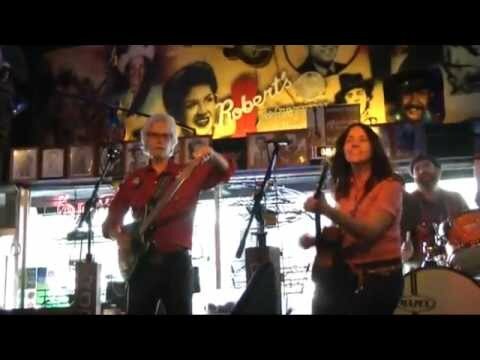 My husband and I travelled to Nashville from New Zealand for our Honeymoon and came across Silver Threads at Bobs. It was exactly as we hoped, a bit if Buck Owens and lots of Loretta and Patsy a real authentic Honky Tonk sound. Eileen's voice and energy was amazing. LRG is a fantastic guitar player and we yearned to see some Steele played live, he was worth the wait. The following year we came back (got the bug) and saw them again and again and, I think, again. These guys are sooo good. If I won the lottery I would bring them over to play here... I keep buyin those tickets and until I win I will just stick to listening to the CDs whilst wearing my Silver Threads t-shirt. The Silver Thread is a must see band!! We were out touring around on Friday afternoon when we walked by Robert's Honky Tonk Saloon! Her voice was just drawing! We went in, ate the best Hamburgers and fries, had a couple Mich Ultra's, took some great pictures, and I must say, had the best time right there!!! She was outstanding, the band was awesome, and I will definitely pat attention to her in the near future! Great Band!!! We happened to hear them while walking down the street. A few minutes of casual interest turned into 3 hours of rippin' tunes and jaw dropping musicianship. Go see these folks! Must See Group on Lower Broadway! Take 2 girls from New England, throw them into Nashville for a few days, have them walk into a Silver Threads Show and be blown away. So good was Eileen Rose and Boys - each brilliant in their own right, that we came back for a second show the next day, and wished we could have stayed longer. Hands down the highlight of our trip, bought a cd for a gift and wound up listening to it for 3 days before giving it away (need to get another!). Can't wait to come back to Nashville and see The Silver Threads. Heard 8 or 9 different bands while on vacation in Nashville-enjoyed Eileen, Rich and the Silver Threads by far the most. Would not want to visit Nashville without hearing them again. By all means one should purchase their CD's. Great Talent at Roberts Western! Enjoyed them very much. Will be following them to see how they are doing. They are a fantastic band. Definitely a fun group. and we were blown away by the Silver Threads. An incredible band!! They were so tight, and excellent entertainers. 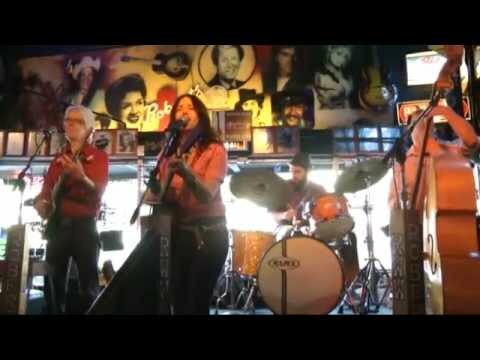 It is a five piece band - drums, steel guitar (guy was great), guy on stand up bass(he could be a show by himself) an incredible lead guitarist, and Eileen Rose on vocals is unbelievable - an incredible talent!! If you get a chance, see them. It will worth your time and your money (beers). Next time we are in Nashville, we will definitely see the Silver Threads!! OUTSTANDING! Stopped in for a minute & stayed the whole set as there was none better on Broadway. All members uniquely talented & awesome. I'm still smiling! Review by Julianne S. C.
My friend took me to the Bluegrass Inn to hear The Silver Threads. He had told me that they were excellent and he was so right! I hardly ever go out to see live bands because they just never really measure up, but this group is truly excellent. They have so much energy and the skill level of the musicians and the singing is just outstanding. I was really blown away and I definitely recommend seeing them or booking them! If you're like me and find yourself searching for some great Live music you have to check out The Silver Threads. 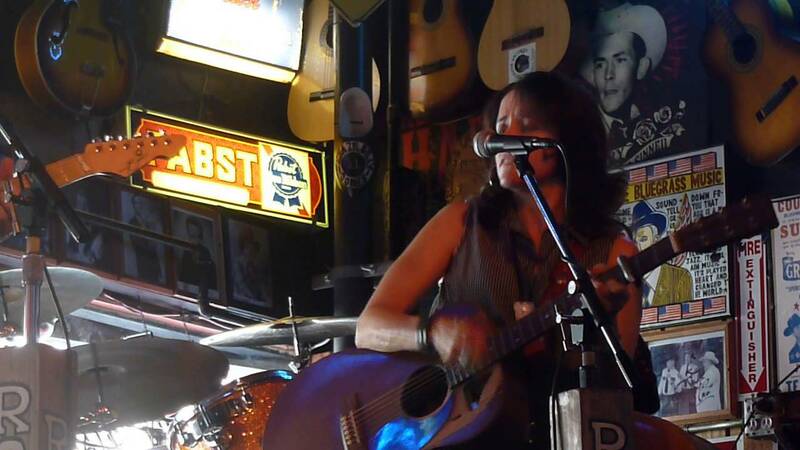 Eileen Rose on lead vocals and acoustic guitar will keep you wanting to hear more of those classic covers she performs. She has a great look and stage presence to go along with that great voice of hers. She comes across as a nice girl but with enough of an edge to make you believe some of these songs she's singing have been some of the things that's happened in her life. When you add Rich Gilbert who is one of the best electric and pedal steel guitar players I've ever heard then you have the making of one of the best musical experiences that can be found in Nashville Tennessee which is their home base. But wait, do you like the cool look and great sound of an upright bass? Me too and they have that as well. So do youself a favor the next time you're in Nashville and go see this band playing down on lower broadway. On our visit to Honky Tonk Row in Nashville, we kept gravitating back to Robert's Western World, pulled by the Silver Threads. It took about 3 seconds to fall in love with the singer, Eileen Rose, whose stage presence holds her audiences in warm, rapt attention. Eileen, who has recorded several CDs as a solo artist, is equally adept on the acoustic guitar. But it is her beautiful, sometimes bawdy voice, that keeps you coming back — that and the wonderfully wild fretboard antics of upright basist Zach Shedd and aptly nicknamed steel/guitar player The Legendary Rich Gilbert. These groups cover all the country music greats, but what they dish out best are good times! Rob Roberts, editor of KC Business and managing editor of KC Magazine in Kansas City, Mo. We have a huge song list country-dancin’ songs and rockabilly songs by the most popular classic country male and female artists. Women like Patsy Cline, Loretta Lynn, Tammy Wynette, etc., as well as a great list of songs that aren't usually covered by similar bands like Connie Smith, Lynn Anderson, Brenda Lee.... We also play PLENTY of tunes by some of the all time great male country and rockabilly greats: Johnnie Cash, Hank Williams, Buck Owens,George Jones, Merle Haggard, Wayland Jennings, Johnnie Horton, Carl Perkins, Buddy Holly and Elvis. We are very experienced professional Nashville musicians who are used to playing all kinds of different events from house concerts to festivals, country weddings and corporate events, as well as our regular weekly shows at Robert's Western World, Layla's, The Full Moon Saloon and other honky tonks on Lower Broad. We have a large repertoire of songs and since we play together so (and for SO many hours) often we can go with the feel of the room and play a set to suit that particular audience. Since we have both female and male singers, we can cover a lot of songs. We know hundreds. We can be quiet and pretty or loud & rockin', as needed. We're extremely professional and experienced. We can perform as a duo, three piece, four or five or six piece (if you'd like one or two fiddles added). Playing classic country and honky tonk music by the greats that started it all: Hank Williams, Johnny Cash, Kitty Wells, Ray Price, Tammy Wynette, Hank Snow, Loretta Lynn, Patsy Cline, Ernest Tubb, Bob Wills, Connie Smith, Buck Owens, Skeeter Davis to the outlaw mavericks that kept it going, Kris Kristofferson, Willie Nelson, Lynn Anderson, Waylon Jennings, Jessi Colter, Merle Haggard, Emmylou Harris and many more…. 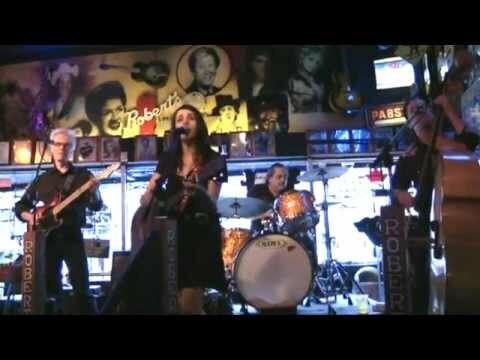 Singer/songwriter Eileen Rose and her band The Silver Threads play classic honky tonk sets each week in the legendary honky tonks of Nashville’s famous Lower Broad. The Silver Threads have quickly become one of the “must see” bands in Nashville and is comprised of a stunning collection of exciting and seasoned musicians. Eileen Rose has released 8 solo albums, all written by Eileen herself, on several popular labels (including the much loved Rough Trade Records and Nashville’s own Compass label). She’s toured the world and back, had her song “Shining” featured in the Disney movie, The Rookie and several songs on major television shows. She belts out Tammy and Patsy like she was born to it and writes her own brand of outlaw country songs which have garnered a clutch of fans from Nashville to London, Boston to Rome. The Legendary Rich Gilbert has been tearing it up on telecaster and pedal steel with some of the greats for years. This year, he appeared on The David Letterman show, Conan O’Brien and The Grand Ole Opry with the great Wanda Jackson and Mr. Jack White! His solos are jaw dropping, unpredictable and thrilling, his pedal steel work so beautiful, he’s made the widow of Don Helm’s himself cry and step up to the stage to thank him and shake his hand. Johnnie Barber has played drums for some of THE all time greats: Ernest Tubb, Loretta Lynn, Charlie Louvin, Merle Haggard and, from 1978-1984, with Johnny Paycheck! He’s a drummer’s drummer, playing true country drums like very few can these days. Joe Fick is a doghouse bass thumping phenomenon. 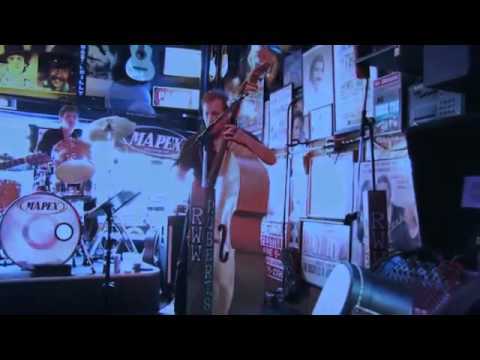 Performing for years with the popular Memphis band, The Dempsey’s, Joe’s Nashville star is on the rise. He performed at this year’s CMA awards in the opening song with Carrie Underwood, Brad Paisley and Keith Urban! He also played Elvis’ bass player in the Cash biopic, Walk The Line. NOBODY solos like Fick. Josh Hedley is another rising star. He is the fiddle player in Justin Townes Earle's band and is a talented vocalist and songwriter, releasing his debut solo EP in 2009. He sung with Eileen on her last album, and she describes him as her 'Emmylou'! No special needs. We simply require a vocal PA. Hundreds of traditional country songs, plus a few vintage surprises!